The EHRA First Responder App Concept - firstresponderapps Webseite! The "EHRA First Responder App" helps to save lives in the context of sudden cardiac death (SCD) and is one "puzzle-part" of a bundle of measures against SCD. Where implemented, the App allows bystanding persons to provide life‐saving assistance to victims of SCD. Users who have proven they are trained in cardiopulmonary resuscitation (CPR) and willing to assist in case of an emergency can be notified over the EHRA First Responder App if someone nearby is having a cardiac emergency and may require CPR. See our Mission Video from the Pilot in Lübeck for a short introduction. The application has also a location database for publicly accessible Automated External Defibrillators (AED). Additionally the System has a link to the central European Registry of Cardiac Arrest (EuReCa One) - all cases can be tracked centrally over Europe. In June 2016 the System had its 100.000 tracked case and numbers are growing. 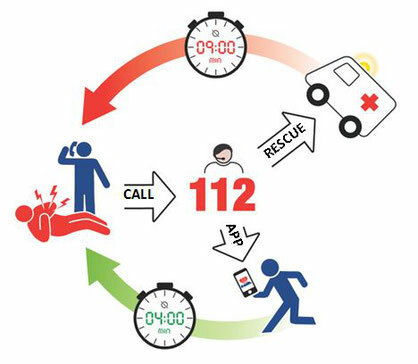 The EHRA First Responder App Initiative is a free scientific Initiative of the Heart Center Lübeck and the Institute for Emergency Medicine (iRun) of the University of Schleswig-Holstein. The project is financed over scientific and private funding and is free for partners to join. The App architecture is an enterprise-class, backend-as-a-service (BaaS) pre-arrival solution designed to support emergency departments working to improve cardiac arrest survival rates through improved bystander performance. The software has an universal-unidirectional interface to most Emergency alert systems in Europe and can be connected easily in a few steps. Most efforts in the project went into a legally proven solution for EU-countries. The system is based on a legal paper and implements all standards on EU data security and the given high legal standards. To implement the EHRA First Responder App, different contract variants are available and a ReInsurance solution is provided by a third party if required by Your department / emergency unit. Want to implement the App in Your country? Contact us! We are happy to help You implement the solution in any EU country. If You are a government organisation or local authority / emergency department, please feel free to contact us to get some test download of the App and to conference with us on implementing the software at Your site.